What is one thing that we're all looking for at this time of year? That's right - a new calendar! Personally, I think buying a new calendar at the end of each year is kind of exciting. I've always enjoyed reflecting over the prior year as I update the new calendar with birthdays, anniversaries and other special occasions. 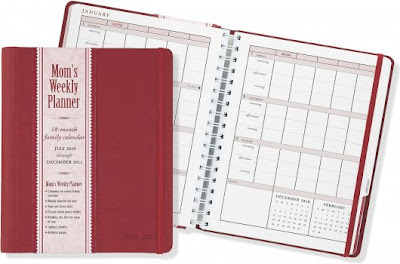 My favorite calendar of all times is Mom's Weekly Planner which is put out by Peter Pauper Press. Furthermore, if you are super duper organized, you can plan out your days by morning, afternoon and evening! I think this calendar does a good job at appealing to the "I need to jot this down right quick" type of mom as well as to the more detail oriented mom. (I fall into the former category, personally.) I love the amount of space I'm given in which to write down our life plans as well as how neat and organized it makes my desk look. Instead of having notes strewn about I can keep all my thoughts and plans in one handy dandy book and it looks great! Per Peter Pauper Press's usual standards, Mom's Weekly Planner is nicely spiral bound inside a hard back cover and comes in a red or blue cover. Perhaps even more exciting for you today - I am happy to say that Peter Pauper Press has offered up one of these calendars to one of my readers here at Reading to Know. Care to win? Simply leave a comment below. This contest is open to U.S. Residents only and will be open through Sunday, December 5th. THE WINNER (as selected by random.org) is #14 - Lisa! Congratulations! Merry Christmas too, of course, specifically from Peter Pauper Press! Ooo...I love a new calendar every year! This does look like a really good calendar...the only negative is that I didn't get it in July of this year. For me calendars definitely need to be preprinted...I mess up the dates if I have to write them in...so this looks perfect for me. I love my calendar...and bring it out to schedule everything. I blogged about your week. This looks like a good one to try! Just made a note to buy a new calendar for 2011...this would be PERFECT! I love the layout of this planner. It actually "works" if you know what I mean. Thank you so much! Thanks for sharing this one. It's good to find new styles of calendars. Oh yes, 18 months would be just about right... ;) I actually have something in my head that's 3 years away! My father-in-law and I are much alike (it's his event that's in my head). I used to carry a planner like this when I was in high school and college. Sooo nice to keep track of when major projects were due, work schedule, etc! I could use some organizational help. I am looking for a new calendar. This one looks awesome. I would love to use this one this year. I'm always looking for a better way to get organized -- this calendar looks like a great solution :) *Thanks* for the giveaway! This would be a GREAT calendar for keeping track of homeschool schedules. I would love to have it! Would love to win...thanks for the opportunity! This would help me keep track of things. i could so use this calender since next year will be busy busy, come next august I'll have a 5th grader, a kindergartner and I'll be back in college to finish up my early childhood degree! Being organized is the best! Sounds like a great calendar ... thanks for sharing. I think I'm actually going to buy myself a calendar/planner this year. I was all set to buy a busy body book, but now you have me torn about which to buy. I'll have to check this one out. Oooh, I'd love this planner! I love calendars! This would be lovely! Thanks! My daughter could really use this, it seems like she always has some where to go. This would help her keep track of her appointments. I use planners every year & carry them with me everywhere! I can really use this! Thanks for hosting! A calendar is great giveaway this time of year! This looks like it would really fit the bill. Thanks for the info and chance to win! Oh, I could use a new calendar/planner. This sounds perfect for me! Thank you for the chance to win!